We are going to take a walk through some of the best and most original pools that we find throughout the world, something that does not come at all bad, now that we are already in the middle of spring. Do you want to go with us? The pool of this hotel complex in Algarrobo (Chile) is considered as the largest pool in the world. It is 1 kilometer long, 13 meters wide and 3 meters deep. 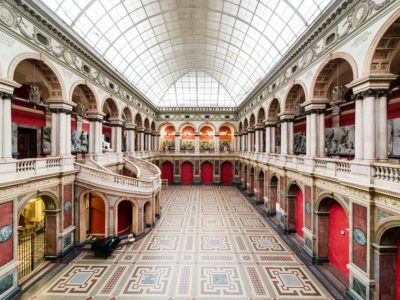 A unique location for your audiovisual production or photographic shooting. 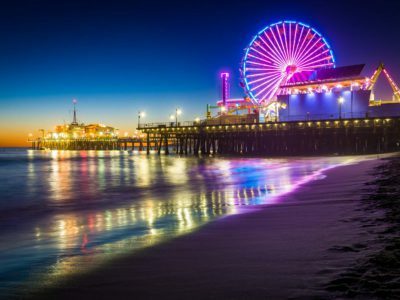 It takes 250 million liters of salt water, directly from the Pacific, to fill it. The Marina Bay Sands Hotel is the most famous hotel complex in Singapore, consisting of three hotel towers of 50 floors each. 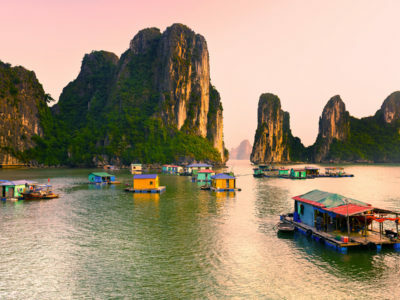 It is 200 meters high and joined at the top by a huge boat-terrace, called Sky Park, with a length of 340 meters. 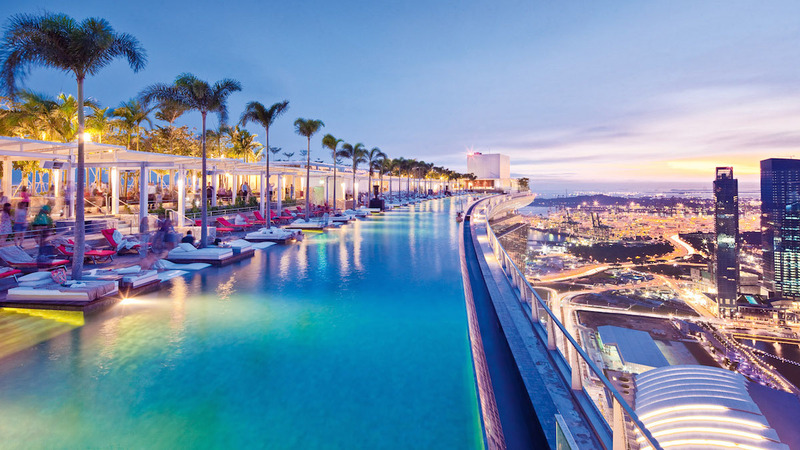 It contains a spectacular pool without borders of 150 meters, one of the longest in the world. Swimming at a height of 200 meters is a vertigo experience for your audiovisual project. 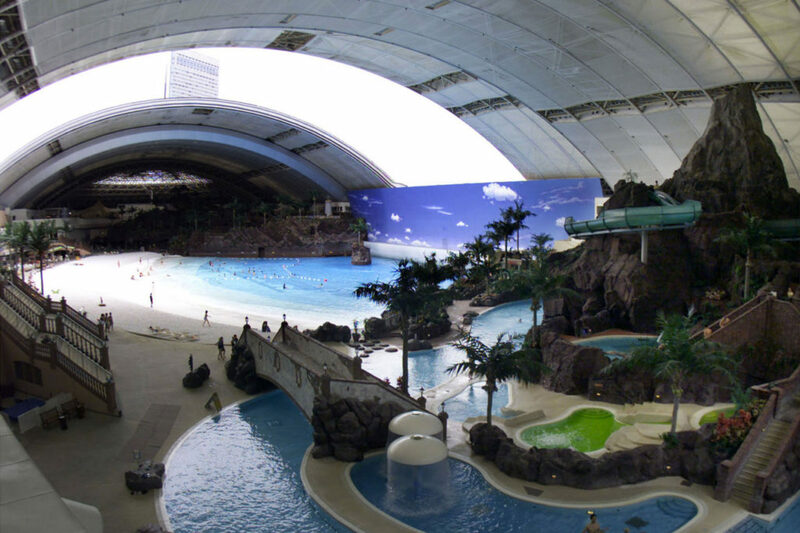 The Ocean Dome is the largest indoor pool in the world, the complex measures 300 x 100 meters. The temperature inside the pavilion is very pleasant, it is maintained at 30 degrees Celsius, the ceiling is sky blue and it even has “clouds”. One of the main attractions is a kind of artificial volcano whose eruptions generate waves in the pool, a water show for your photographic shooting or more original audiovisual production. 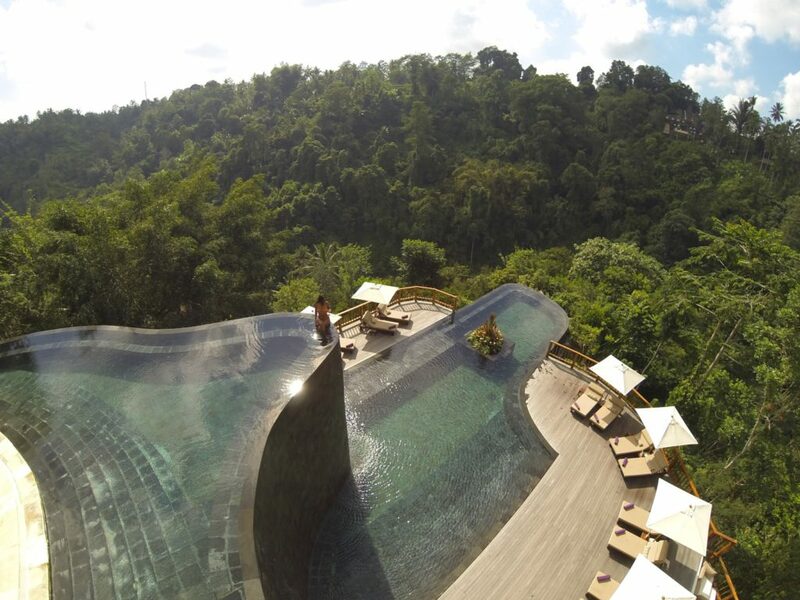 The hanging pools of the “Ubud Hanging Gardens Hotel” in Bali are characterized by large infinity edge swimming pools at different levels, with curves that copy the shape and beauty of the nearby hills, full of rice fields. A location located in the middle of nature for your audiovisual project. 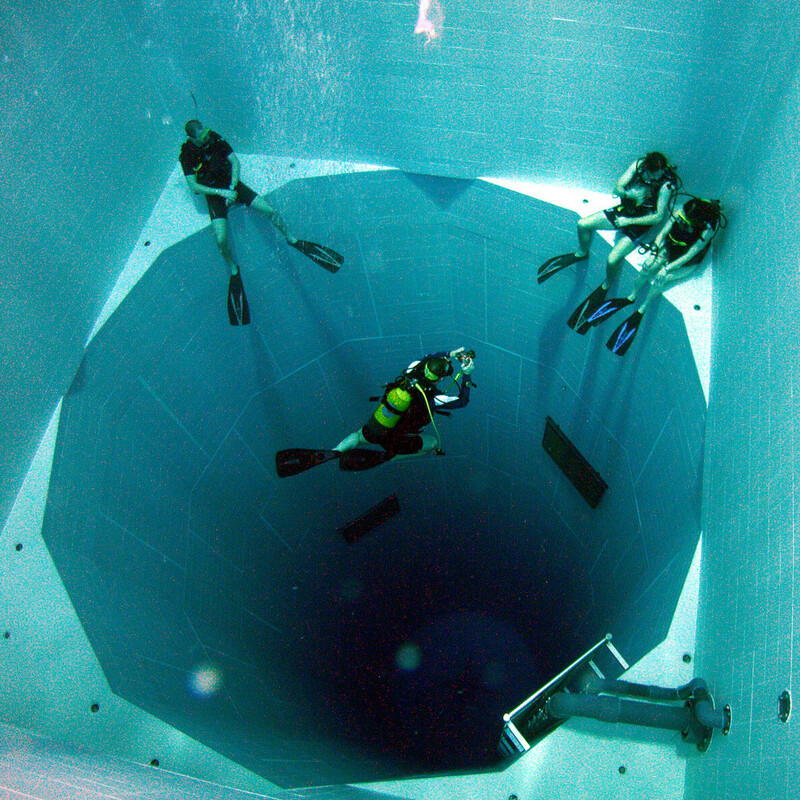 One of the deepest pools in the world with a depth of 33 meters is located in Brussels. It consists of 5 levels of 1.30, 2.50, 5, 10 and 33 meters deep. For photo shootings or audiovisual productions under water is it ideal. The pool has a capacity of 2.5 million liters of water and is currently used for professional training and beginners in diving. 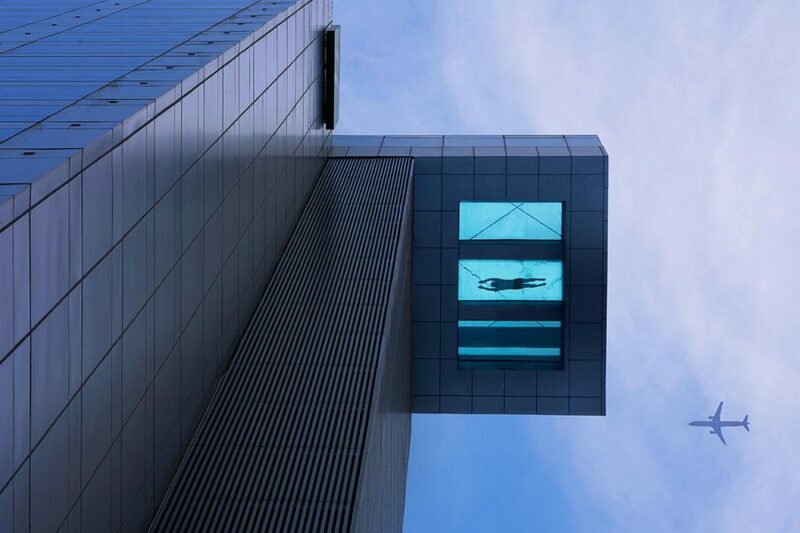 The pool of this hotel is suspended in the air at a height of 100 meters. A horizontal extension of the 24th floor of the hotel contains a most original pool. 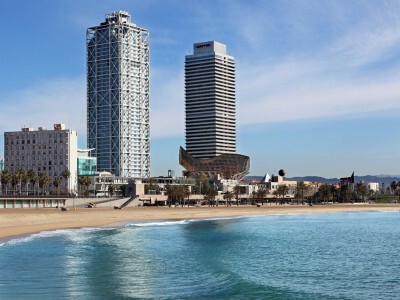 Its bottom is made of strengthened glass, an incredible sensation for the bathers. 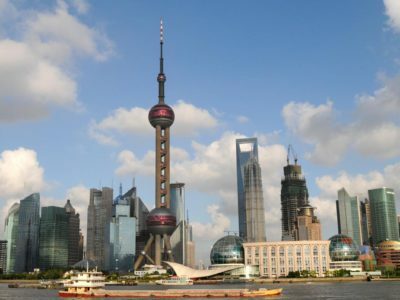 In addition they will be able to enjoy a panoramic view of Pudong. Awesome views for an audiovisual project of height. The pool is 30 meters long, 6 meters wide and 1.5 meters deep, and is the first of its kind in China. This original pool, located in a mansion, was built with extreme care and precision, and is an exact replica of the famous Stradivarius violins. 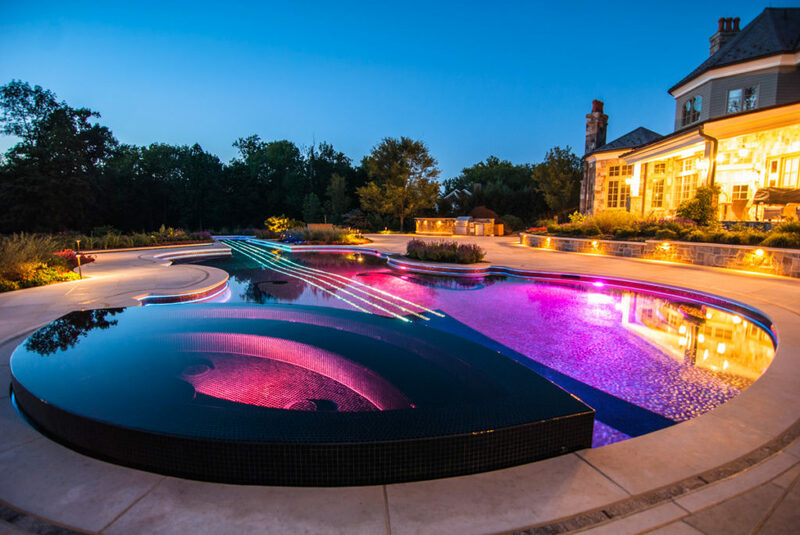 It is designed by Cipriano Landscape Design & Custom Swimming Pools. Maybe the perfect location for your next audiovisual production or photo shooting? 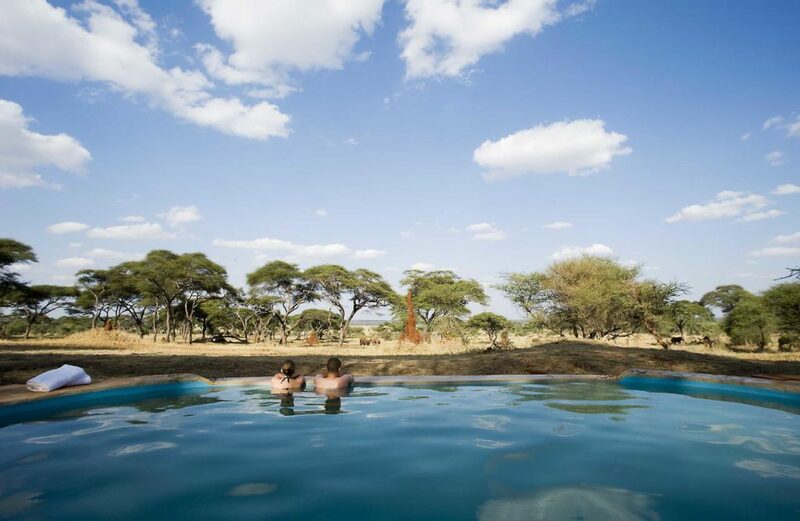 The Swala Sanctuary pool sits on a well in an isolated area of the Tarangire National Park and offers views of elephants and antelopes. It is an incredible backdrop, full of the traditional African baobab trees. An impressive background for any photographic shooting or audiovisual production. 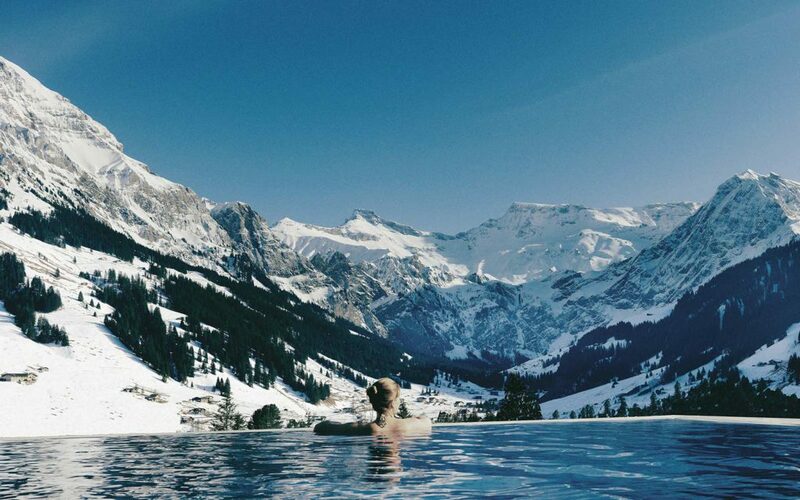 This heated outdoor pool at the design hotel The Cambrian, in the Swiss Alps, gives the feeling of swimming straight to the snow-capped mountains. It is equipped with massage jets. Can you imagine your audiovisual project in this location? 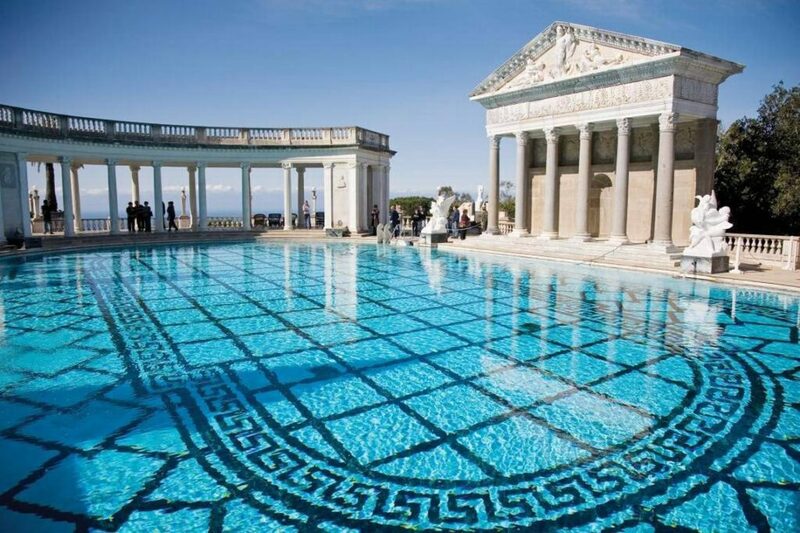 The newspaper magnate, who inspired the film Citizen Kane, built two spectacular Roman-style swimming pools in his fairy-tale castle, Hearst Castle, in the middle of the hills. 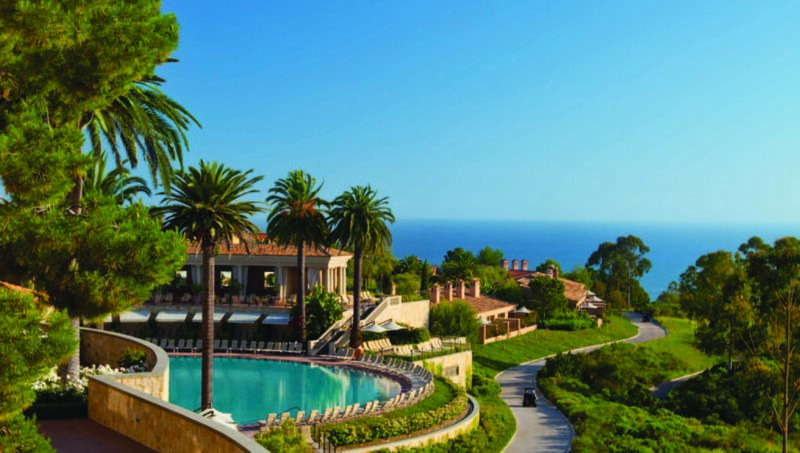 The Neptune Pool is the central attraction of the tours that are made on the property. Although it is no longer allowed to swim in it, it can be an exceptional background for your photographic shooting or audiovisual production. The surprising color of the pool The Library arises from its base, which is a mosaic of glass tiles in orange, yellow and blood red. 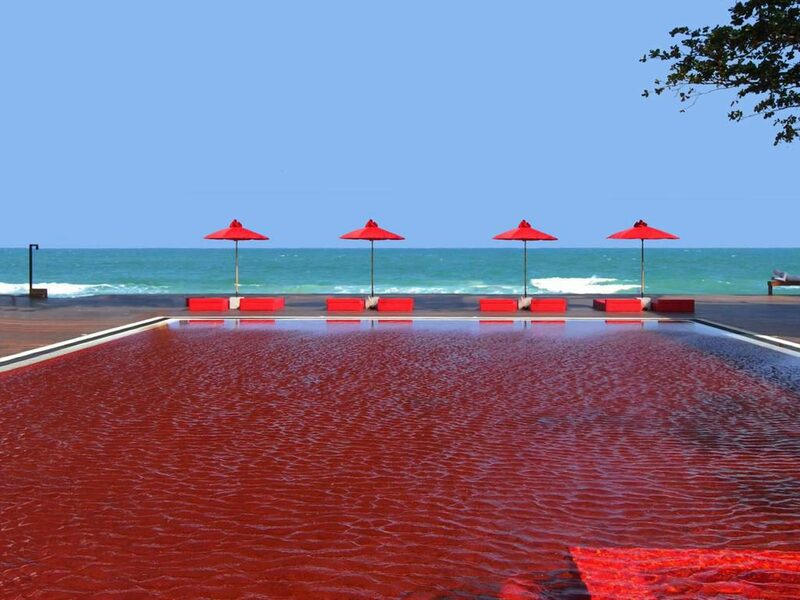 The effect is enhanced by the red mattresses that surround the pool. At night, the lights inside the pool transform it into a dazzling spectacle that you can capture in your most daring audiovisual project. 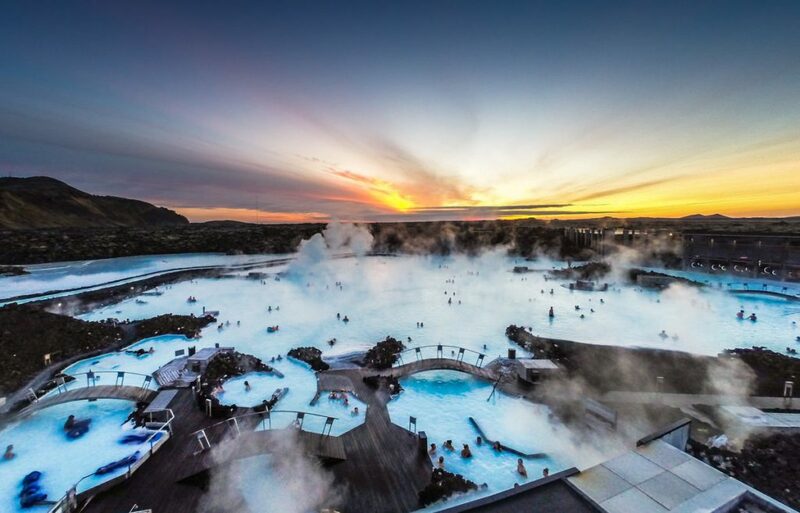 This geothermal spa is located in the heart of a lava field in the southwest of Iceland. 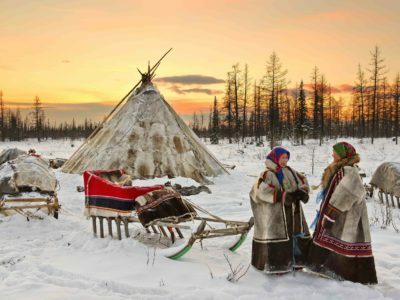 It is famous for the healing and rejuvenating qualities of its thermal waters, and has become one of the favorite destinations of the country. Vapors and an unparalleled background for an audiovisual production or totally relaxing photographic shooting.